If you haven't gotten a chance to stop by Digital Projection International's booth #N647 at InfoComm, you're missing out. DPI are showing their new 4K resolution, laser illumination combo projector, and it's stunning. DPI's INSIGHT LASER 4K projector has 20,000 hours of illumination life with no lamp replacements required. The INSIGHT LASER 4K projector has 20,000 hours of illumination life with no lamp replacements required. It delivers bright, stable, and color-accurate imagery with remarkably low lifetime cost of ownership. All with the stunning detail and image subtlety that only full 4K resolution can deliver, and all at approximately 40% of the size and weight of existing 4K projector solutions. DPI’s 12,000 lumen INSIGHT LASER 4K will begin shipping in late 2014. The INSIGHT LASER 4K introduces an incomparably compact 4K projection solution for discerning professional, simulation, visualization, entertainment, worship and large-screen applications. Venues where both image detail and image stability are critical will directly benefit from both the INSIGHT 4K’s crystal clear resolution and solid-state illumination platform. Applications where image uniformity is a critical concern, such as venues employing the same content across numerous screens simultaneously, will immediately realize value from the INSIGHT’s consistent solid-state illumination performance. 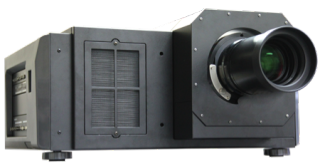 In environments where the projector will be installed in hard-to-reach locations, the impressive limited maintenance of the INSIGHT LASER 4K display will save installers and end-users both time and maintenance costs. As with DPI’s recently launched HIGHlite LASER projector, the INSIGHT LASER 4K has been developed with a ‘Set it and Forget it’ directive, delivering impactful imagery with minimal maintenance throughout the lifetime of the display. Equally compelling is the elimination of lamp replacements due to the solid-state illumination system. By bypassing regular lamp replacement cycles, nearly all lifetime costs for the INSIGHT are incurred at time of purchase. This key characteristic allows the INSIGHT and HIGHlite LASER displays to provide a much lower cost of ownership over the lifespan of the system. Venues looking to produce a dazzling visual experience will realize true cost-saving benefits through the INSIGHT LASER 4K’s advanced illumination technology. Engineered within a lightweight and rugged all metal chassis, the INSIGHT 4K series delivers superb imaging clarity, rendered through DPI’s expertise in integrating powerful 3-chip DLP technology with precision optics and resizing engines. Combine the exceptionally bright, long-life illumination source with a host of other powerful features, and you have a projector solution that’s perfectly suited to a diverse range of professional venues. The INSIGHT 4K also delivers full 4K 3D display capability. Dual HDMI and DVI inputs enable the latest high-bandwidth video delivery. A full range of 4K lenses, offering throw ratios from 1.13:1 to 4.98:1, with extensive vertical and horizontal lens shift, is available to support nearly any installation requirement.